As the media has reported, Indian firms are involved in land grab with relation to Ethiopia in particular. Food insecure nations like those of the gulf region are also participating in these land deals for the purpose of food production for their home countries. A major argument by governments and investors is that these investments will lead to economic development for the home countries. The Oakland Institute reports reveal, however, that the land transactions are either for free (in the case of Mali) or very cheap (in the cases of Ethiopia and Sierra Leone). These transactions are largely unregulated with no stipulation or guarantees that they will help the local populations or create infrastructure. While land grab actors focus their rhetoric on foreign direct investment, there is no evidence to show that foreign direct investment will come into the countries in any substantial amount. Most of these deals come with huge tax breaks and other investment incentives which is a great deal for the investors, but means less money coming into the country that could possibly go to infrastructure or social services. For instance, Sierra Leone allows 100 percent foreign ownership; there are no restrictions on foreign exchange, full repatriation of profits, dividends and royalties and no limits on expatriate employees. Another justification for the land deals includes the idea that they will increase employment in the areas involved. Again, the lack of stipulation and on-the-ground research reveals that this is overstated at best and completely untrue at worst. The Emvest Matuba investment project summary and staff at Emergent and Emvest promise job creation with majority employment from the local community. A recent head count provided by Emergent reveals that currently only 17 permanent positions are in security (36 staff). In Mali, the area targeted by recent large land deals which could easily sustain 112,537 farm families (over half a million people, 686,478) is instead in the hands of 22 investors and will create at best a few thousand jobs. To make matters worse, the limited employment created by these land deals is low wage, seasonal and primarily benefits the investors with cheap labour to compliment cheap land. While those involved firmly contend that communities are not being forcibly removed from their lands and those that are asked to move are being compensated, the opposite proves true. Ethiopian government officials, for instance, have stated that the lands being leased are unused or abandoned. Meanwhile, there is a villagisation process that has relocated 700,000 indigenous people who lived in a land that was targeted for investment. In 2010 in Samana Dugu, Mali, bulldozers came in to clear the land and when the community protested, they were met by police forces who beat and arrested them. In Tanzania, the land investments of AgriSol Energy are focused on Katumba and Mishamo refugee settlements. The MOU between AgriSol Energy and the local government stipulates that these settlements, which house 162,000 refugees that fled Burundi in 1972 and have been farming the land for 40 years, have to be closed. In June 2009, Amnesty International reported refugees being pressured to leave camps. Some of them lost their homes to a fire set by individuals acting under the instructions of the Tanzanian authorities to get them to vacate the camp. Refugee leaders who have attempted to organize affected refugees have been arrested and detained. Investment sites in various African countries visited by the Oakland Institute revealed a loss of local farmland where the lands held a variety of different uses and social/ecological value. Some of the lands that are claimed to be unused are those where the communities practice shifting cultivation (where plots of land are left idle after periods of cultivation in order to re-vegetate), pastoralism, and those considered communally used areas. Forests and national reserves that are home to vital animal, fish and plant species and is a place where communities have found alternative sustenance in times of food scarcity have been burned and cleared out. These lands are being destroyed without an understanding of their significance and without assessments to determine how this will affect local communities. Many of the communities interviewed stated that there was no prior notification of the land investments. They only realized what was happening when the bulldozers arrived in their communities. While most of the countries and regions targeted suffer from food insecurity, these land deals focus on producing export commodities, including food, biofuels and cut flowers for foreign consumption. In Mali, half of the investors with large land holdings in the Office du Niger intend to grow plants used to produce agrofuels such as sugarcane, jatropha or other oleaginous crops. In Mozambique, most of the investments concern timber industry and agrofuels rather than food crops. Food crops represented only 32,000 hectares of the 433,000 hectares that were approved for agricultural investments between 2007 and 2009. In Ethiopia, much of large scale land deals have focused on food production for a foreign market. Because land grab throughout Ethiopia has led to the clearing of communal lands and plots used for shifting cultivation as well as forests, the communities’ primary source of sustenance along with their buffer systems are threatened. Additionally, commercial farming on these lands will affect fish habitats and other wildlife hunted in times of food scarcity and the loss and degradation of grazing lands will further increase food insecurity. Water is of a particular concern as runoff from commercial farms will lead to the contamination and reduction of water supplies. Dam construction in investment site areas like the proposed Alwero River dam spark additional concern of the consequential uncertainty of access to water for local and downstream communities. No clause has been found in the lease agreements that discusses water use and there is no evidence that water use from commercial agriculture is managed, monitored or regulated. In Ethiopia, not only is there no clause in any of the lease agreements that require investors to improve local food security conditions or make food available for the local populations, the federal government has actually provided incentives for those investors that grow cash crops for a foreign market. Abera Deressa, federal minister for agriculture stated that, ‘If we get money we can buy food anywhere. Then we can solve the food problem.’ A major concern of the communities interviewed is that they believe the government is intentionally creating a situation where communities must rely solely on the government for their food, in an attempt to marginalize and disempower them. Environmental degradation is a major concern in these land deals that have limited transparency and regulations in terms of their environmental impact. Forests have many uses for the local communities including as food, medicine, fuel wood and building materials. Forests also retain cultural and historical significance. Expected outcomes of clearing the lands and forests include loss and degradation of wetlands, decrease in wildlife populations and habitat, proliferation of invasive species and loss of biodiversity. These environmental concerns are exemplified in Ethiopia’s Gambela National Park where the Ethiopian Wildlife Conservation Authority (EWCA) estimates that 438,000 hectares of land have been leased in the vicinity of the park. While the park boundaries are not set, lands that the local population considers a part of the park have been cleared by large-scale investors, including Karuturi and Saudi Star. Wetlands have been altered and forests have been cleared. According to recent surveys, the Gambela National Park is home to 69 mammal species, valuable wetland habitat, hundreds of bird species and 92 fish species. To compound matters, the practice of industrial agriculture will lead to increased toxicity, disruption of nature’s system of pest control, creation of new weeds or virus strains, loss of biodiversity, and the spread of genetically-engineered genes to indigenous plants. Additionally, it will put these countries at a disadvantage for mitigating and adapting to climate change. For many of these land deals, Environmental Impact Assessments are not widely used or enforced, making this situation all the more alarming. 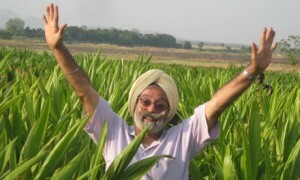 In December 2010, the United Nations came out with a report that stated that the benefits of agroecological methods far outweigh those of industrial farming techniques. It added that we can double the world’s food supply if we support small farmers. The research of the Oakland Institute echoes the same conclusion. For instance, in Mali, where the system of rice intensification has been adopted along the Niger River near Timbuktu, farmers have been able to attain yields of five to 15 tons per hectare per year, for an average of nine tons per hectare. This is more than twice the conventional irrigated rice yield in the area, and more than the previsions of the Moulin Moderne du Mali, one of the major investors. This irrigation system involves plots of 35 hectares of land, shared by as many as 100 farmers, meaning each household has access to only one-third of a hectare. Still, from that piece of land, they are able to earn $1,879 – more than double the average annual per capital income of $676. While research proves one thing, government officials and investors do the opposite. Instead of supporting small farmers, these land deals support industrial agriculture while displacing and disempowering the very people that have the ability to shift their communities from insecure to sustainable populations and environments. Land grab puts these countries on a path that will surely lead to increased food insecurity, environmental degradation, increased reliance on aid and the marginalisation of farming and pastoralist communities. With regards to food, the issue at stake is not only one of increased food insecurity, but an attack on food sovereignty or peoples’ right to produce their own food. Land grab is irrational at best and violent at worst. It’s a violent act to take away peoples’ right to food, access to their ancestral land, their social and historical ties, and their overall right for human dignity. It’s a violent act to strip them of their future and the land of its fertility. While land deals are going on behind closed doors, communities are resisting. The 2008 food uprisings, the revolt in Madagascar against land grab, and the recent protests in Guinea, all show communities who are standing up for their right for food sovereignty. In fact, in all of the countries visited, the land deals were met by community organising. Knowing what we know, resisting these land deals on all fronts and working towards investments in sustainable agriculture and empowering local populations points to the only rational and humane way forward. This article by Agazit Abate, a 2010-2011 Intern Scholar at the Oakland Institute, is based on the research and publications of the Oakland Institute.